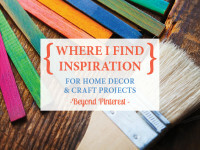 I think we all need the occasional Saturday afternoon with our craft supplies sprawled out on the living room floor, whipping up a simple but satisfying craft project while binge watching Pretty Little Liars. Hey, it’s cheap therapy and you end up with a crafty creation to show off. My mission for my latest Netflix + crafting session was to transform a thrifted picture frame into something beautiful and festive for the holiday edition of the Thrift Store Swap. 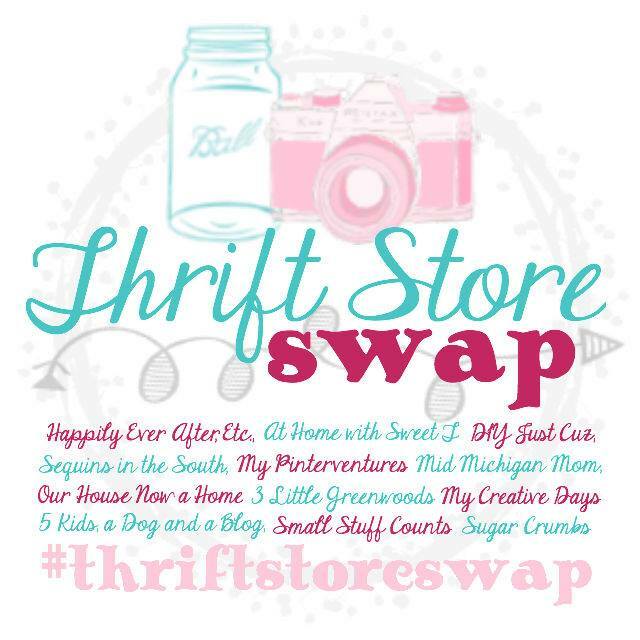 The Thrift Store Swap is a group of bloggers that each hunt a thrift store for two holiday-themed treasures under $10. 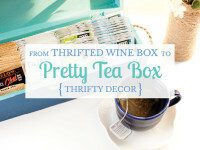 Then, we ship our thrifty finds to one of the other bloggers in the group and another gal ships us a thrifted gift. The swap turns into one big circle! I love picture frames and they’re one of the things I’m always hunting for at thrift stores. However, I struggled to dream up a project that would really ‘wow’ you. For a while, I tried to think up unusual uses for this frame. But in the end, I decided it was meant to remain an actual frame. 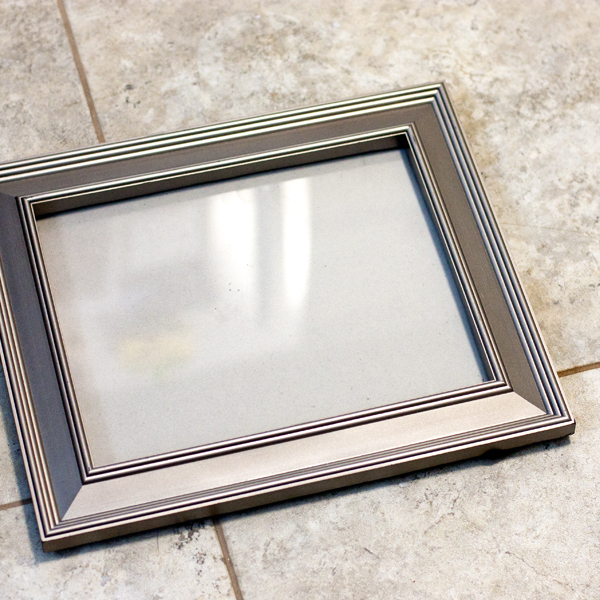 Spray paint is usually my go-to weapon when starting a thrifty makeover, but this silver frame was in such good shape that I opted to leave the paint alone. Instead, I decided to create a mini wreath to hang from it. This entire project took me less than an hour to make, and it was simple enough to do while watching TV. So today, I’m going to tell you exactly how I made this project. Note: This project was made using my Silhouette. 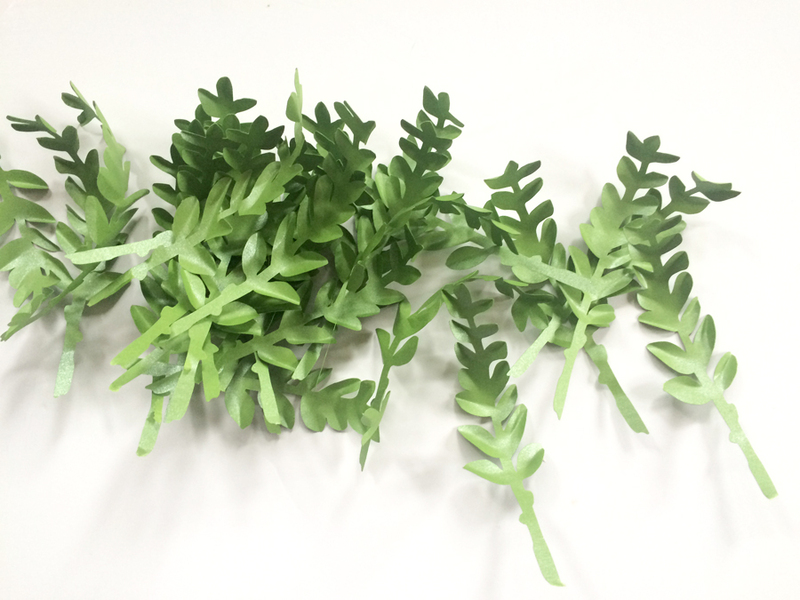 If you don’t have one, you could hand cut all of the boxwood leaves. 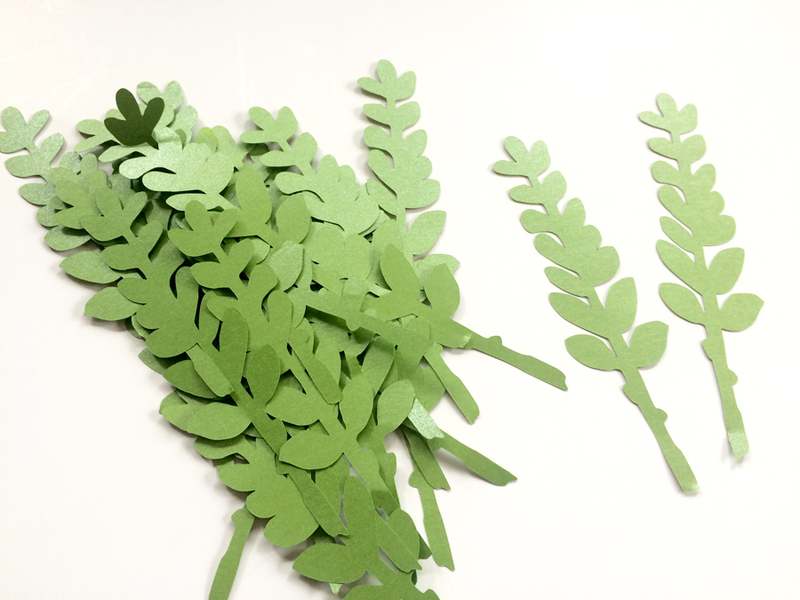 However, if I was doing this with a scissors I would opt for cutting a more simple leaf pattern. It’s totally up to you, though! Another option would be to add a Silhouette to your list for Santa – I’ve been blown away by all the things I can make with mine and it’s certainly one of my favorite gifts I’ve received. If you want to shop for one for yourself, here is my affiliate link. Get the Silhouette Cameo if you can, but if you’re on a budget check out the Silhouette Portrait. That’s what I have and I highly recommend it. Alright, now on to the tutorial. Download my free boxwood leaf .svg file (for personal use) and open it in your Silhouette Studio software. You’ll want to go to the Cut Settings window and make sure “Cut Edge” is selected, and then select the type of paper you are using. Adjust your blade setting accordingly. (I set my blade to 3 for the medium-weight green paper I used). Stick a sheet of paper to your cutting mat and load into your Silhouette. Then click “Send to Silhouette” on the screen and it will begin cutting. I cut three pages of leaves, but the number you will need will vary based on the size of your wreath. 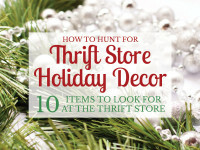 I used a sturdy paper plate as the base of my wreath. You could use card board or a heavy card stock as well. I traced the bottom of a cereal bowl to create my circle outline. It’s about 5 1/2 inches in diameter, but of course you can make yours whatever size you’d like. I used scissors to cut the outside of my circle and then cut out the inside, leaving about 1/2 an inch between the inner and outer circles to create the shape of a wreath. I didn’t do this, but would recommend you take a sheet of your leaf paper and cover your wreath base in it. Some of my white plate showed through at the end, and it would have been easier to have it the same color than it was to try to glue all my leaves to strategically cover every fraction of white that showed through. After my leaves were all cut out, I spent some time giving them some dimension. I simply folded each individual leaf down its center. This step took some time, which is why it was perfect for doing while watching TV. 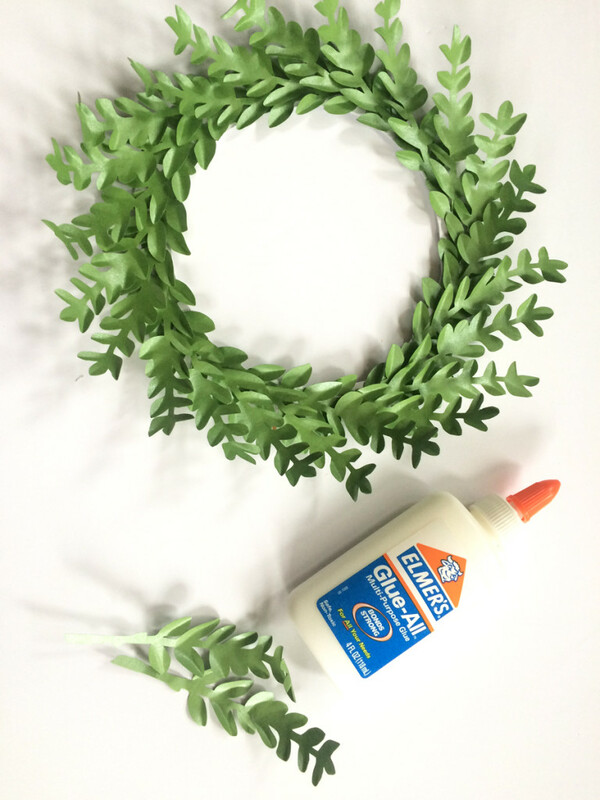 While your glue is drying, insert some pretty paper into your picture frame to create a background for your wreath. I had a sheet of metallic card stock on hand and decided the silver would look nice. You could use any color you’d like and any type of paper. 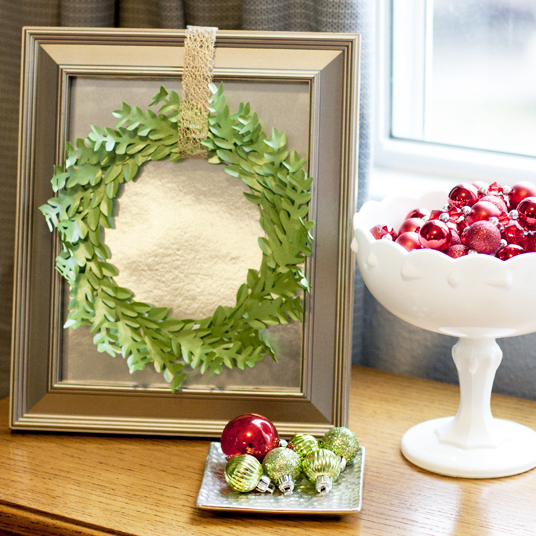 Now you’re ready to hang your wreath! I cut a piece of ribbon and looped it through the wreath. To attach it to the frame, I simply pulled the ribbon up over the top of the picture frame and used a couple pieces of Scotch tape to secure it to the frame’s backing. Since the wreath is so light weight, the tape is plenty to hold it in place. And, voila, you have a beautiful mini boxwood wreath! I adore this little wreath. It looks festive against the metallic frame, especially sitting next to some shiny ornaments. But this project is something that can transition with the seasons. By changing the color of the ribbon and the paper inside the frame, you can make this framed wreath work with any color scheme. I hope you’ll give it a try! Thanks for visiting today! Stay tuned, because in a couple weeks I’ll be revealing the transformation of the second thrift store item that Laci sent me for the Thrift Store Swap. 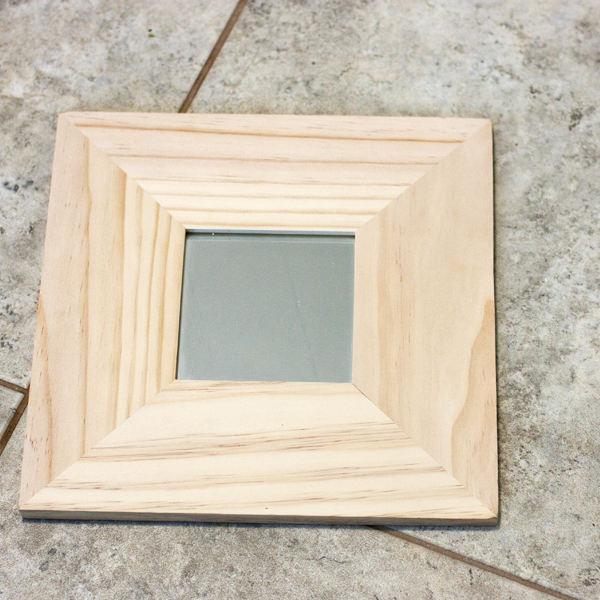 Any guesses as to what I did with this framed mirror? What a great project! 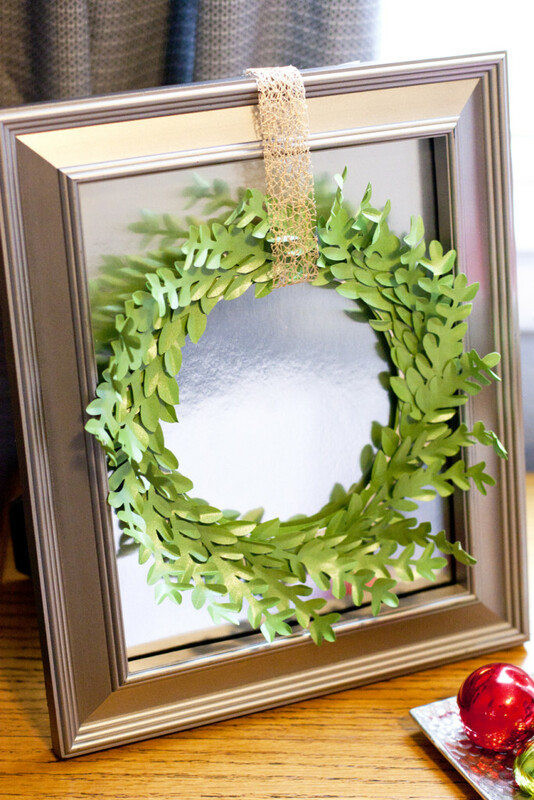 I love that you used paper to craft the boxwood wreath. 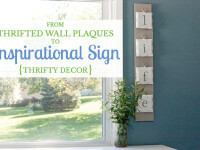 Thank you for sharing at Create • Share • Inspire! I hope to see you back tonight! What a fun project, Emily! And what a fun group of bloggers to craft with!! I love it. I really need to make better use of my Silhouette and learn how to create my own cut files. Your wreath is so awesome! My silhouette is my favorite gift! I’ve really used Pinterest to find some fun tutorials on how to use it. There’s just so many things to do with it that’s it tough to think up on your own. Thanks for visiting! Super cute upcycle! I love the look of boxwood wreaths and would have never thought of making a boxwood wreath from paper. Pinning! Ashley, you should totally try out making a paper wreath! I have no doubt you would dream up something more fabulous than mine. Love this! 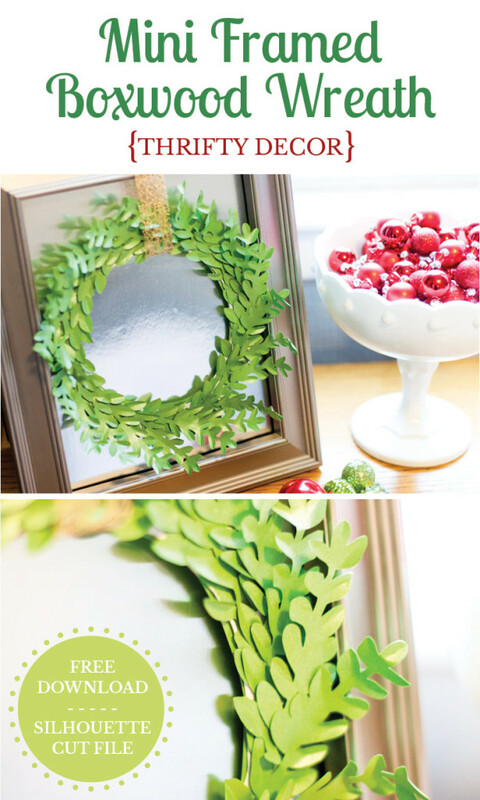 I really like the lighter green you used for the leaves, it feels so fresh and fun for the holidays. Thanks, Emily! Ahh, I’m glad you mentioned the green paper. I totally forgot to talk about it in my post, but that paper is all leftover from my wedding which was three years ago now! I keep saving it for something special I guess. The green paper has a bit of shimmer to it which is really pretty. I would have left the frame the same too, it looks brand new! The wreath turned out great! I love how creative this is… even though it looks so easy! I still haven’t figured out the whole silhouette thing… maybe it’s time to get a move on! I absolutely love it… can’t wait to see your second project! Thank you Betsy! After one year of experimenting with my Silhouette, I have to say it’s been one of the best gifts I’ve ever gotten. There’s just never-ending possibilities! Let me know if you have any questions! Emily, LOVE this wreathe! I’m excited that you shared the file and gave specific directions because Santa is giving me a Silhouette Cameo for Christmas! The Amazon box with my cameo is under my tree right now and I want to use it so badly! lol This project is gorgeous! I look forward to seeing the mirror transformation! You will LOVE your Cameo! I’m so excited for you! How tempting to know it’s waiting for you under the tree. I have a few other projects where I shared the cut files, so check those out when you get going with your Silhouette and let me know how you like it! Thanks so much, Lisa! I’m pretty happy with it. I loved your project as well! WOW! Your project is amazing!!! I love it so much! Sharing and pinning! Thank you! Your project looks great as well!